Appropriately named the “Green Mountain State,” Vermont is a breathtaking state that plays host to some of the most scenic mountain biking trails in America—trails designed to test riders of all ages and ability levels, while also providing miles upon miles of the gorgeous scenery that makes Vermont such a popular locale for recreation enthusiasts. A relatively small state by total area, Vermont is situated in the northeastern and New England part of the United States, sharing borders with Massachusetts to the south; New Hampshire to the east; New York to the west; and the Canadian province of Quebec to the far north. The state takes its nickname from the renowned Green Mountain Range, whose wooded forests, running from north to south, cover roughly 75 percent of the state’s total land area, providing a virtually unlimited number of exciting and often hair-raising mountain bike courses for cyclists to enjoy. From the banks of the Connecticut River and Lake Champlain, to the Alpine peaks of Mount Mansfield, Vermont offers a treasure trove of great mountain biking courses that are guaranteed to please riders, regardless of their particular skill level. To illustrate this point, below we have compiled some information about five of Vermont’s most popular courses, highlighting some of the characteristics that make each of these mountain biking trails so well-loved by local and out-of-town riders. Killington Mountain, located in the town of Killington, Vermont, is a true mountain biker’s dream, offering challenges like no other course in the state. With courses designed for every level of rider, from beginners to experts, this scenic locale offers roughly 45 miles of trails that range from classic cross-country single track to challenging big-bike downhill routes to free riding trails that will test the skill level—and nerve—of even the most experienced off-road cyclists. Killington Mountain features a 4,000+ foot climb to its summit, but if this seems like more pedal power than you’re willing to exert, you are definitely in luck; all of the trails at Killington Mountain are serviced by the park’s K-1 Express Gondola, which effortlessly transports riders and their bicycles to the highest lift-serviced peak in Vermont, thus transforming this up-and-down course into a 100 percent downhill adventure. Riders of all ages and ability levels will fall in love with the trails at Killington Mountain, trails that range from easy going dirt roads to rugged and very narrow single tracks. Along these courses, riders will need to negotiate a series of natural and manmade obstacles and impediments, including jumps, drops, berms, rocks and more. Killington Mountain additionally plays host to a full-service mountain bike shop that offers bike rentals, repairs and a full line of clothing and accessories. Lessons and tours are available by appointment, and can be scheduled either online or in person, regardless of one’s particular skill level. Situated in the town of Colchester, Vermont, Sunny Hollow is a 5.5 mile loop trail that offers more than its fair share of excitement for intermediate to advanced riders. The out-and-back loop begins at the Brooke Crossing trailhead and winds through the region’s North Plateau and Outer Limits, before proceeding towards the Triborough Bridge to the “Teardrop” and “Blueberry” loops. Taking roughly 60-90 minutes to complete (depending on speed and skill level); the Sunny Hollow Loop is the perfect ride for skilled riders, including competitive cyclists. The trail is made up of somewhat sandy, yet very well-drained terrain, smooth berms and a number of great manmade bridges. Other obstacles on the course include roots, jumps, hair-raising drops, and a series of switchbacks on the ascending portion of the course. The Sunny Hollow Loop Trail additionally offers some very scenic and picturesque vistas, traversing high above the lush green valley below. Situated in the town of Rutland, Vermont, Pine Hill Park has one of the best purpose-built trail systems in the entire state of Vermont and beyond. Although categorizing the park’s trails as “fun” is completely accurate, the adjective does not go far enough in explaining the all-out adventure riders will experience on these breathtaking and well-kept trails. All of the courses at Pine Hill Park are immensely entertaining, well-maintained, and jam-packed with challenging obstacles designed to test the cyclists’ bike handling skills. Some of the great features of Pine Hill Park include its grueling climbs, rewarding descents, walled berms, jumps, drop-offs, rock gardens and many, many more. As riders arrive at Pine Hill Park they will be immediately greeted by a large sign directing them towards the main trailhead, from which all of the courses commence. Here they will also find a detailed map of each trail, allowing them to accurately chart their upcoming ride, and informing them of the various characteristics of each route. Pine Hill Park spans a total of 300 acres and offers 16 miles of unique and enjoyable trails. Owned by the city of Rutland and managed by the Rutland Recreation Department and the Pine Hill Partnership, this fabulous mountain biking park is made possible via a cooperative effort between the city and the residents of the local community. 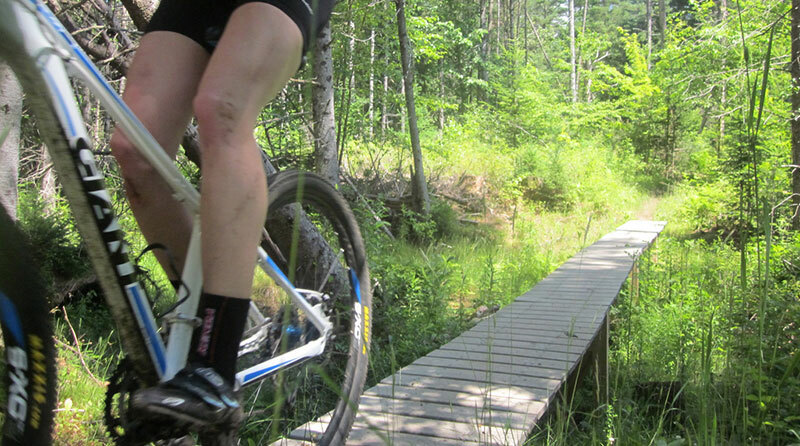 Located in the town of Burke, Vermont, the Kingdom Trails are not only the most highly rated system of trails in Vermont; they were recently voted one of the “Best Trail Networks in North America,” as reported by Bike Magazine. With the breathtaking scenery of northeastern Vermont serving as a backdrop, these challenging, side-winding routes offer riders a unique physical test and all the thrilling exhilaration associated with downhill racing. The Kingdom Trails offer everything from twisting and soft-soiled tracks among the wooded pine forests to challenging, high-bermed descents that are both fast and nerve-racking. The trail system, which is nestled in a quiet, remote corner of Vermont, was established by local residents and business owners in the area looking to preserve and conserve the local natural areas and promote economic growth in the region. The Kingdom Trails include a number of out-and-back loops, with routes designed to please riders of all ages and ability levels. All of the courses are very well marked, but locals recommend you secure a trail map before setting out, as the maze of trails can be rather confusing for those who are new to the park. With names like “Tap ‘n Die,” “Sidewinder,” and “Troll Stroll,” the playful-sounding trails here offer riders hours upon hours of riding entertainment—a total of 150 miles of well-groomed trails, including many that are used for competitive races. Located just five miles off Exit 10 in the town of Waterbury, Perry Hill is one of the most well-loved mountain biking parks in all of Vermont—a location that is home to some of the state’s best and most well-maintained trail systems. With courses that are highly technical at the top and easily flowing through the acres of wooded pine groves, Perry Hill is unquestionably one of the state’s most prized recreational gems. Perry Hill offers just less than eight miles of amazingly technical and fast single track and the most hair-raising descent in the state of Vermont—a 1,600 foot drop that ranges from an eight percent grade to a scary 23 percent grade. Along the way riders will need to negotiate a series of natural and manmade obstacles, including root sections, rocks, berms, skinnies, switchbacks, bridges and water crossings—impediments that consistently lure some of the state’s best riders. In addition to the challenges presented to riders who dare to test Perry Hill’s terrain, the courses here also offer some of the most gorgeous scenery in the state of Vermont. Perry Hill’s trail system is open to the general public—at no cost—from March through late October, although it is always wise to call ahead.